MEDELLIN – At the on-going Colombiatex textile show, a raft of sustainable urban initiatives have resulted in Medellin currently competing in an online ballot with New York and Tel-Aviv as the world’s most innovative city, following an initial study by the US not-for-profit Urban Land Institute. If ever a city has tapped into the broad sustainability doctrine of maximising benefits for people, planet and profit, then surely it must be Medellin, which is still struggling to shake off an image for violence and corruption that is now decades out of date, but deeply ingrained. The country has also just secured a free trade agreement (FTA) with the European Union, which makes this week’s 25th anniversary Colombiatex textile show in Medellin rather timely. Fittingly, it was opened (January 22) by no less a figurehead than Columbia’s president himself, Juan Manuel Santos Calderón, who in an admirable display of soundbite-free engagement, actively encouraged difficult questions from textile entrepreneurs on how to take the industry forward. 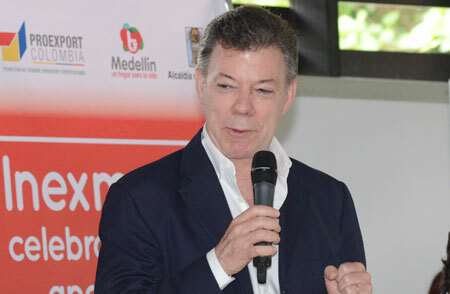 He also encouraged his followers on Twitter to support Medellin’s cause in the Innovative City poll. A full report on Adrian Wilson’s visit to Colombia will appear in the next available printed issue of Ecotextile News magazine.